With my purchase of the Asus Strix GTX 970 graphics card, I am able to achieve GPU (Graphics Processing Unit) rendering times between 5.5 and 7.5 times faster than CPU rendering. 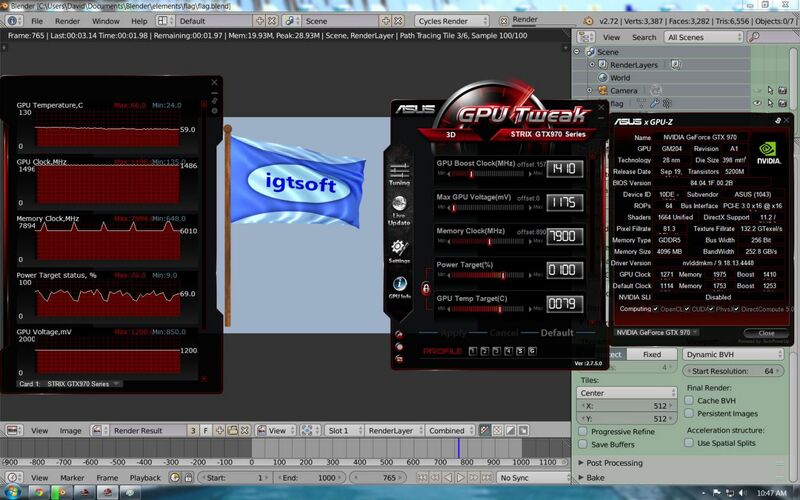 Rendering 1000 frames at 720p resolution for the Flag in the Wind sequence takes 5 hours on the CPU while GPU rendering completes the task in 51 minutes. While awaiting official Blender 2.73 support for GTX 970, I run a modified Blender 2.72 to support Nvidia GTX 970 CUDA (Compute Unified Device Architecture). The Asus Strix GTX 970 graphics card ships with GPU and memory clock settings which have been overclocked above the reference Nvidia GTX 970 implementation. 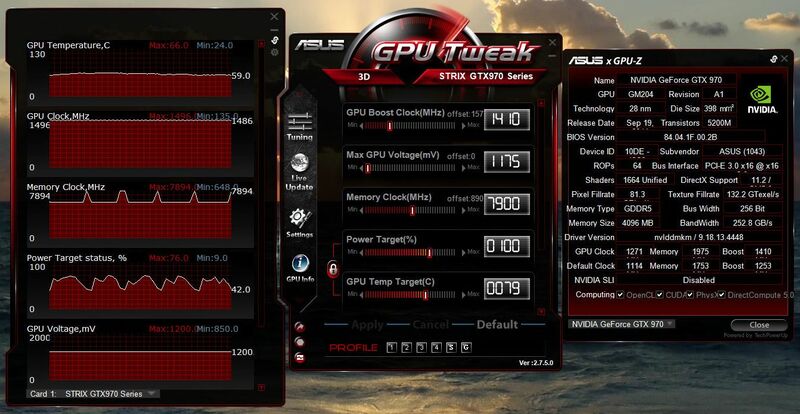 The factory settings for the Asus Strix GTX 970 are 1253 MHz GPU clock with GDDR5 memory runnable at 7010 MHz. I have stable 3D rendering operation with further overclock boost to 1410 MHz for GPU clock and 7900 MHz for memory clock. During 3D rendering, the GPU is running at a steady 1486 MHz while memory is running at the base 6010 MHz rate with peaks to 7894 MHz. The only two elements that I changed above factory settings are the GPU Boost Clock and Memory Clock. 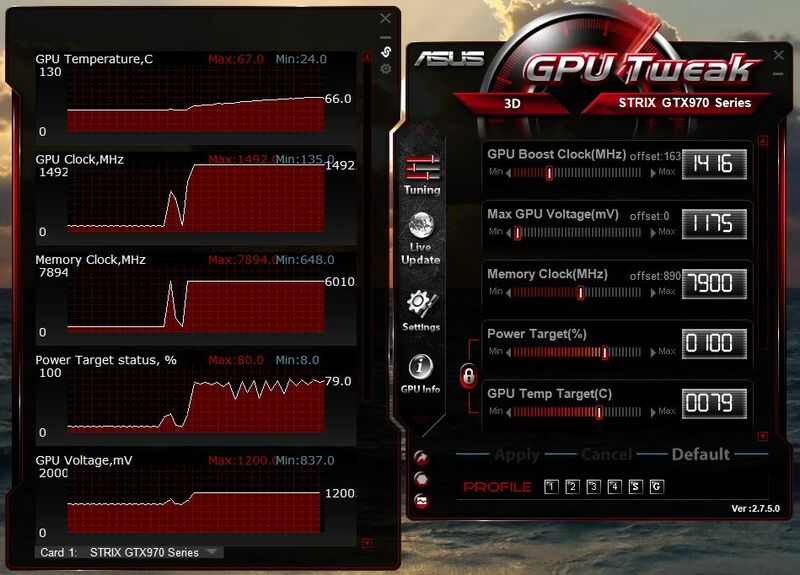 As far as I know, the Asus Strix GTX 970 draws a maximum of 1.2V. During rendering, the GPU voltage is at a steady 1.2V with a decently low GPU temperature of 58C. The 2 fans on the Asus Strix GTX 970 do not spin until the GPU temperature reaches 65C. For my typical 3D rendering runs, the 2 fans are not spinning. I have seen temperature reaching 70C with fan speed around 900 rpm which remains very low in noise. I would say the CPU and case fans in my system dominate the noise level generated by my computer. During usage in the absence of rendering, GPU voltage is typically 862mV with GPU and memory running at 135 MHz and 648 MHz respectively. 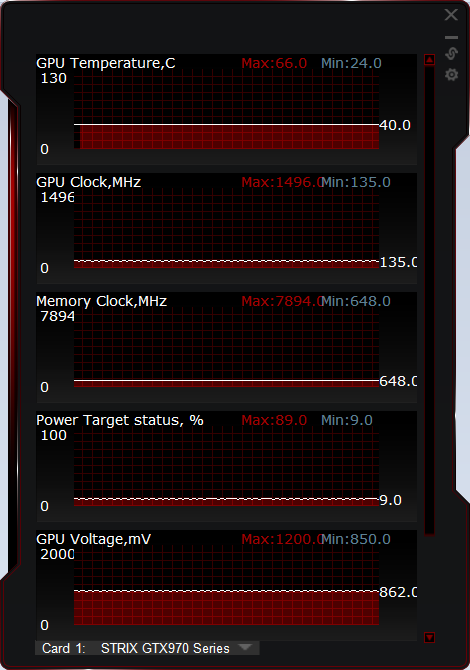 Power draw is 862mV with GPU temperature 40C. Click the thumbnail image to see larger view. Feb 15th, 2015 update: After reading reviews on the recently released GTX 960 which has good overclocking ability, I decided to push my GPU clock to see how high I could go. When I settled for the 1410 MHz GPU Boost Clock, I had gapped down from 1420 MHz which failed to run in stable fashion. With incremental trials, I was able to get stable GTX 970 operation with a GPU Boost Clock setting of 1416 MHz, resulting in a peak GPU clock of 1492 MHz. My GTX 970 is pushed to its limits when doing Blender 3D rendering as well as playing Assassin's Creed Unity.